And suddenly you see more. Every eye is as unique as a human fingerprint. 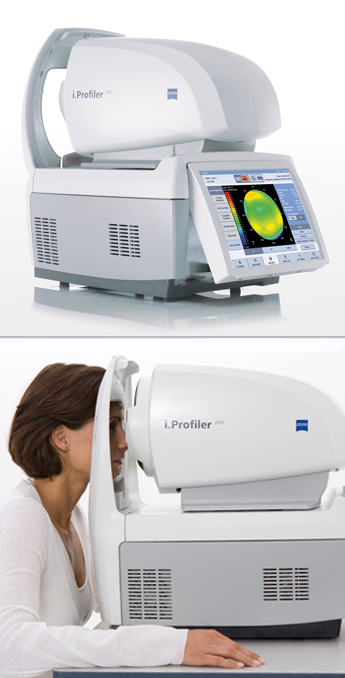 With i.Profilerplus® by ZEISS more than 2,500 reference points within your eye are examined to produce an extremely detailed vision profile. Unlike traditional exams, varying light conditions are also taken into account to provide customized vision—both day and night. This comprehensive information is used to create a refined prescription or i.Scription®, that perfectly matches your unique vision profile. The resulting eyeglass lenses are produced to an accuracy far higher than seen in traditional eyeglass lenses and are personalized especially for your unique vision needs. As a result, vision problems, such as blurry vision, halo effects, and visual discomfort can be recognized and improved. Eyeglass lenses with i.Scription technology can improve color and contrast, as well as vision at night and in low-light—giving you your best vision possible. ZEISS precision lenses with i.Scription technology for better vision. Better Night/Low-light Vision. Looking directly at a light source at night, such as car lights, results in glare and halo effects. i.Scription technology by ZEISS reduces image noise. Better Color Vision. i.Scription technology by ZEISS adds brilliance to your life and lets you see colors as they really are: bright and more intense. Better Visual Contrast. Seeing contrast, such as white letters on a black background is especially challenging for the eyes. i.Scription technology by ZEISS sharpens contrast.